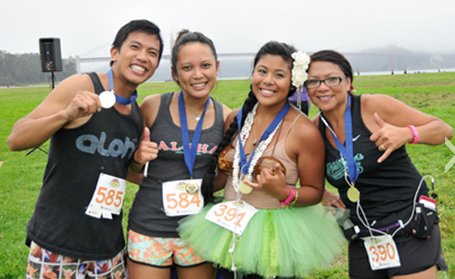 SAN FRANCISCO — The fifth annual SF Aloha Run 2015 will take place on Sunday, Sept. 27. at 610 Old Mason St. (across the street from Sports Basement), Presidio of San Francisco. The run/walk begins promptly at 8:30 a.m., followed by one-mile and 100-yard events after the 5K has concluded. With a spectacular view of the Golden Gate Bridge, runners/walkers of all abilities will enjoy the scenery of Crissy Field, Hawaiian-style music and entertainment, tasty aloha treats and children’s activities. Sponsored by Japanese Community Youth Council, the family event will feature a new and improved course that will once again include a 5K run/walk, a Keiki Run (ages 6 to 13) and Tot Trot (ages 2 to 5), special activities for younger athletes, and doggie treats for your four-legged companions. All participants will receive an SF Aloha Run T-shirt as well as goodies and treats from the sponsors. Post-run celebrations will include beverages and snacks (include Spam musubi), Hawaiian music, and keiki activities for the young and the young at heart Entertainment will be provided by Ke ‘Olu Makani O Mauna Loa. Proceeds will benefit the children and youth services of JCYC, a 501(c)(3) nonprofit community organization. Registration is $40 for ages 14 and over, $15 for youth (13 and under), $10 for pets. For more information, visit www.sfaloharun.org.